The proslavery mission of the University of Mississippi touched nearly every aspect of campus life. In this, and subsequent, posts, we examine how student participation in antebellum literary societies on campus not only centered around and advanced proslavery ideology but was facilitated by the labor of enslaved people. Is there a probability that the American Union will be divided within fifty years? Was the nullification of South Carolina justifiable? Are the influences which tend to perpetuate [the Union] stronger than those which tend to dissolve the Union? Would the southern states be doing themselves a forfeit by seceding from the Union? Can a state under any circumstance justly secede from the Union? The decisions in these debates, which were handed down by the chair, moreover, show the power of proslavery ideology at the University of Mississippi: they suggest that students more broadly believed that the country would shortly be divided, that nullification and secession were justifiable, and that slavery’s future in the United States was at risk. The meeting minutes of Phi Sigma demonstrate that University of Mississippi students were deeply aware of current events that touched on slavery, nullification, and secession. Students heard constantly about these issues in their courses, and they discussed them frequently in their literary societies. These students would later communicate their own proslavery views through the publication of literary magazines, and their devotion to slavery would lead many of them to take up arms for the Confederate cause. 1 The minutes explain that in previous, more casual, meetings the Society went by the name Phi Beta Kappa. After realizing or being informed that their initial name had already been adopted by another group at the College of William and Mary decades before, University of Mississippi students took the name Phi Sigma, which stood for Philostephanie or “lovers of distinction.” Only the last names of the students in attendance at this meeting are listed, and because several students shared the same surname there is some difficulty in identifying all of them. That said, J.H. Bramlett, James William Lambuth, James Hamilton Mayson, John Townes Mosely, John L. Hudston, John Bannister Herring, Joshua Long Halbert, T.S. Wyatt were present, along with one member of the Kilpatrick family (either E.P. or J.G. Kilpatrick), and one of the three Phipps brothers (Jordan McCullough Phipps, Richard Wright Phipps, and B.S. Phipps). Professor John Wadell was also present. Phi Sigma Debate Society Meeting Minutes, May 5, 1849. The Department of Archives and Special Collections, J.D. Williams Library, The University of Mississippi. 2 For general information on the early years of the college, see David Sansing, The University of Mississippi: A Sesquicentennial History (Jackson, Miss. : Mississippi University Press, 1999); Allen Cabaniss, The University of Mississippi: Its First Hundred Years (Hattiesburg, Miss. : University & College Press of Mississippi, 1971); For examples of faculty participation in Phi Sigma debates see the debate notes of William Forbes Stearns in his collection at Archives and Special Collections at the J.D. William Library at the University of Mississippi. 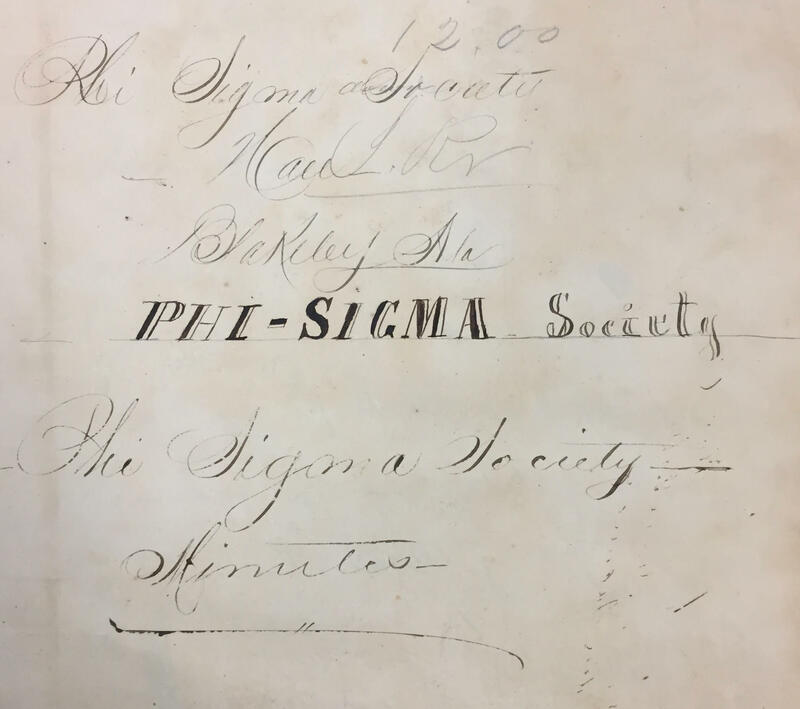 3 Phi Sigma Debate Society Meeting Minutes, September 29, 1849; January 26, 1850; February 9, 1850; October 5, 1850; April 12, 1851; March 28, 1857.